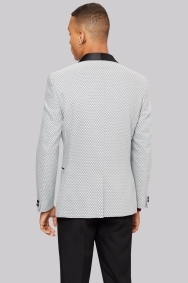 The bold monochrome design of this Moss London jacket will get you seen at your next party. 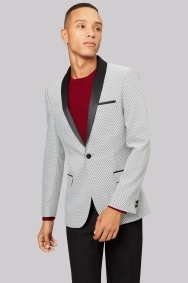 It has a stylish geometric jacquard print to draw in the eye, contrasting with classic shawl lapels to hit the right note at dressed-up occasions. 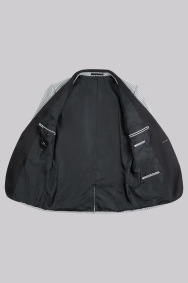 Slim fit, the cut ensures it sits close to your body for a sharp look. Complete the outfit with black trousers and a fine knit jumper to look well-turned-out and laidback. Slim fit suits are tailored to create a distinctive and modern silhouette, providing the perfect opportunity for self-expression. 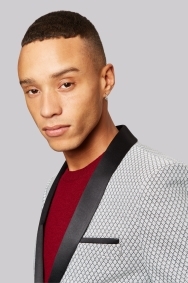 Jackets are closely fitted around the chest, across the shoulders and down the sleeves, while tapered trouser legs complete this fashionable look. To best maintain the suit's edgy contours, a slim fit shirt is always the recommended choice. It's exactly what I want. So goog. Great quality and price. Great sale offers. Really good quality and fit. I love their products, so cool, well-fitting and different. Very good service. 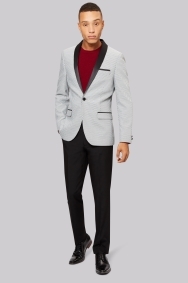 Hight quality and stylish suit jacket. Will buy from this company gain for sure.